Rich in history and natural beauty, the Mediterranean coast is one of the highlights of Israel. 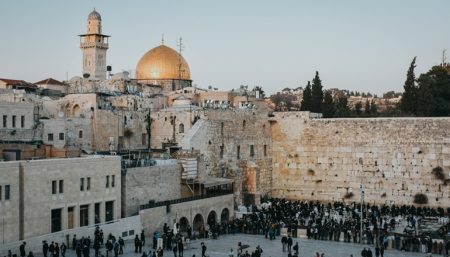 This customizable private tour by Bein Harim will take you up the coastal plain to places like the ancient Roman city of Caesarea, Haifa’s Bahai Gardens, the quaint port city of Acre and to Rosh Hanikra in the far norther reaches of Israel on the border with Lebanon. Along the way, you’ll visit some of the regions most impressive archaeological ruins, take in incredible views and much more. Once the capital of the Roman empire in the Levant, Caesarea boasts some of the most impressive archaeological ruins in the country, such as the amphitheater and the aqueducts, beautiful beaches and amazing sea views. The capital of north Israel and one of the country’s largest and most diverse cities, Haifa is full of culture and home to the incredible Bahai Gardens. Located on Mount Carmel, the UNESCO World Heritage site is one of the most popular tourist attractions in the country and a stunning feat of architecture, incorporating elements of Persian gardens of Shiraz in Iran, the Nishat Bagh gardens of Kashmir and English gardens. Quaint as they come, the ancient port city of Acre has one of the most charming Old City’s in the country, incredible seafood and Hummus Said, one of the best hummus joints in Israel. Nestled along the border with Lebanon, Rosh Hanikra’s grottos are a must-see.